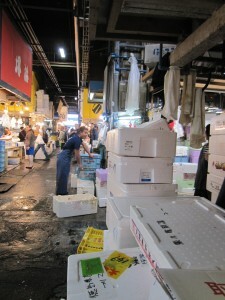 The Central Wholesale Market, more commonly known as Tsukiji Market, is one of Tokyo’s most popular destinations, and for good reason. 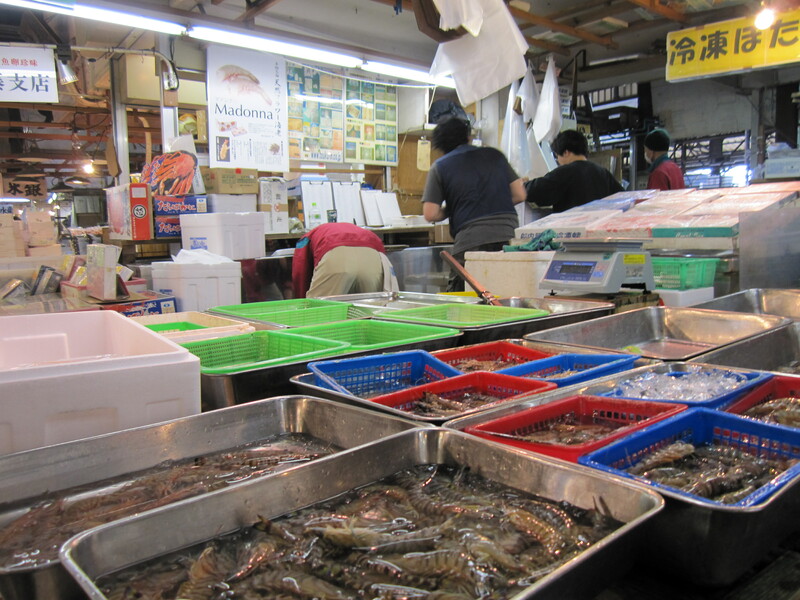 It is the world’s largest fish market, its vendors selling more than 500 varieties of seafood from 700 stalls. Mountains of Styrofoam boxes greet the visitor prior to entering the market. Men with cigarettes dangling from lips or fingers maneuver motorized carts at break-neck speed down speed lanes barely wide enough for two to pass side-by-side. Water gushes from hoses washing down tables used to clean 150kg tuna and 60cm sea eels. It also bubbles up from tanks holding the day’s catch. Voices ring out between stalls as vendors call out orders and banter amongst each other. 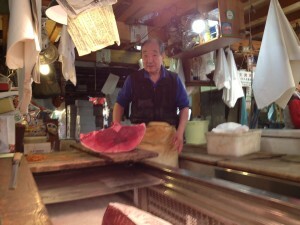 Tsukiji Market truly is a feast for the senses. First, don’t wear flip flops, Crocs, or high heels. This is a fish market after all, and there is running water everywhere. The aisles and lanes between the stalls are always wet, and the vendors are often rinsing off tables or dumping out boxes filled with a slurry of ice, water, and blood. Unless you want soaking feet, wear closed toe shoes with a sole of decent thickness. If your pants are long enough to drag on the ground behind your heels, it is a good idea to roll them up a tad so that they don’t get wet, either. Do say “Ohayo gozaimasu!” (Good morning!) 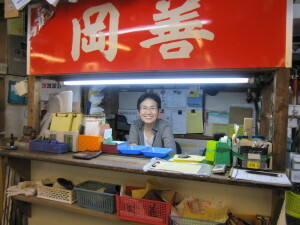 Although the vendors can look dour and unwelcoming, a smile and greeting will be warmly returned. 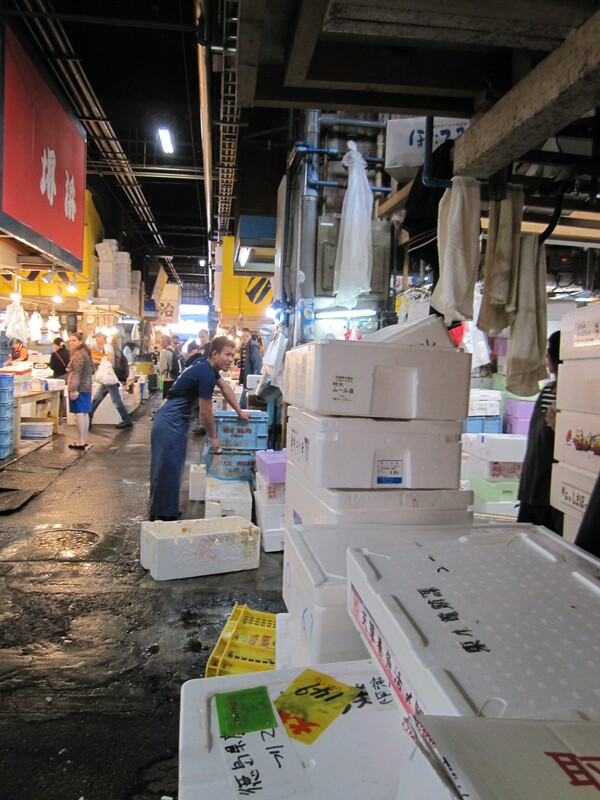 Tsukiji is a working market, not a circus side show – showing the people working there a bit of common courtesy will make your visit much more enjoyable and may even lead to some interesting interchanges with the vendors. In the same vein, it is always good form to ask before taking photographs. The vendors are aware that Tsukiji is a huge tourist attraction and that visitors will take photos, but taking a moment to ask before snapping that shot will garner you some more smiles. Try not to go in large (more than four people) groups. 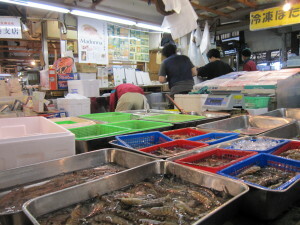 The market is very busy, particularly when the doors open to the public at 9:00am, and trying to negotiate the narrow lanes between stalls with more than a few people will cause “traffic jams.” Most of the non-tourists in the market are buyers and purveyors trying to get seafood for their stores or restaurants, so anything that keeps them from doing this – and prevents them vendors from being able to sell to them – should be avoided. If you are going in a larger group, it might be a good idea to split up into smaller groups and go down separate lanes, agreeing to meet at the opposite end. Don’t feel that you have to have sushi in one of the restaurants located on market grounds! There is no question that the sushi here is just about as fresh as it gets, but getting into the most popular (that is, the ones mentioned by name in Frommer’s, Lonely Planet, etc.) restaurants can entail a wait of up to two hours, and usually no less than 30 minutes. If you head out of the market and into the warren of streets outside of it towards the corner of Harumi Street and Shin-Ohashi Street, you will find places equally as good, with omakase sets at better prices, and no crowds. This means that you can sit and enjoy your sushi with out feeling pressured to finish as quickly as possible and turn your seat over to the next person waiting in line. Finally, trying to get passes to the tuna auction has become a bit more problematic than it was in the past. The number of passes has been limited to 120 people per day, with registration beginning at 5:00am. However, if there are “many people waiting in line, registration may start before 5:00am. (In such case, registration might end before 5:00am)” This means that unless you are there by 4:30, waiting to register, you will probably not be one of the lucky few getting passes into the auction, and will find yourself with a long wait on your hands before the outer market opens. As such, unless you are bound and determined to cross the Tsukiji Tuna Auction off your Bucket List, don’t worry about not viewing the auction. The outer market (that portion open to the public at 9:00am) is still more than enjoyable enough in and of itself – you will still be able to see huge tuna, and in addition many, many other types of seafood, so many that you will not be left for wanting. Last, but not least: as so many others have pointed out – watch out for the carts! Keep you head on a swivel and when coming out of one of the aisles, be sure to look both ways before crossing the lane and moving on. The carts will not stop for you, so be sure not to dawdle in places where they are shuttling around. Now, get out there and enjoy one of Tokyo’s most unique destinations!